. . . he studied Bach obsessively, and his devotion to the composer, and complete understanding of his idiom, is everywhere apparent here. This is a self-recommending issue . . .
. . . [these sessions] reveal Perahia's Bachian mastery at full capacity. The pianist's full and luminous sonority almost disguises the fact that he mainly achieves his clear line playing and colorfully subtle textures through finger power and hand balance, pedaling ever so sparingly. Each of the opening Allemande movements unfolds with spacious eloquence and subtle tonal gradations . . . Perahia's Menuets are gorgeously articulated, with imaginative and meaningful shifts in emphasis on the repeats and a sense of "air" between the notes that is easier to perceive than to describe. He phrases the E major Gigue's imitative writing more cogently than any other pianist I've heard on disc, and treats the D minor Gigue's dotted rhythms with the swagger of a French Ouverture . . . Note, too, the C minor Gigue's quickly flickering ornaments on the repeats . . . I have no hesitation in placing Perahia's French Suites alongside -- and at times a step or two above -- our longstanding [piano reference versions] . . .
A handsome two-disc set . . . These French Suites exhibit all the buoyancy and spirituality that are his hallmarks . . . In Perahia's hands every note of the music sings and its siren beauty is surely impossible to resist. As we expect from Perahia, everything sounds natural and inevitable. Ego doesn't come into it: rather, he acts as a conduit between composer and audience with a purity that few can emulate . . . Take the opening Allemande of the Fourth Suite: in Perahia's hands it's a sinuous, conversational affair and the way he colours the lines as Bach reaches into the upper register is done with enormous subtlety. Or sample the Sarabande of the same suite, simultaneously intimate yet with true gravity. He brings out the left hand's largely stepwise motion to a nicety -- sometimes reassuring, sometimes questioning . . . [in the Gigue of the Fifth Suite,] the rhythms are bright and springy, full of energy without freneticism, and joy is palpable in every note. Or that of the Second Suite, which again sounds completely inevitable, even when he spices it, on its repeats, with dazzlingly daring ornamentation that underlines the inherent dissonances within Bach's counterpoint . . . Perahia's ornamentation could fill the review on its own, for he's happy to take risks, yet they never sound like risks, so firmly are they sewn into the musical cloth . . . I've only had this recording for five days but I predict a long and happy future in its company.
. . . so joyously conceived, so full of insights is this Deutsche Grammophon French Suites debut, it proves to be a decidedly auspicious one . . . The Gigue of the C minor Suite No. 2 buzzes like a wasp trapped in a jam jar, and there's no lack of muscular resolution in the Suite No. 4 in E flat major's Gigue, or its French-style D minor counterpart . . . Perahia is unrivalled in coaxing a subtle dialogue in the dances . . . Perahia's effortless variety of touch, love of teasing voice-leading, and conversational affability would have it no other way. His tempos feel exactly right . . . and the saucy twinkle of the G major Gavotte (No. 5) is emblematic of a set whose "galanterien" unfailingly scintillate . . . Perahia ensures that somehow each aspires to more than the sum of its aristocratic parts . . . [even the rhythmically idiosyncratic Loure from the G major Suite] emerges here uncommonly natural and unaffected . . . this is a set that gets ever more persuasive on repeated listening. This is one of those sets which you know is "right" from the first little ornament Murray Perahia throws in to the descending opening phrase of Bach's Suite No. 1. Ornaments and extra passing notes are just that with these performances -- not big stick-out features of the music, but essential little touches of colour and curls of gold-leaf that make this into something delightfully Baroque, even though we are of course listening on a modern instrument. Perahia doesn't imitate harpsichord sounds even though his use of the pedal is quite sparing. Impeccable technique is the surface gloss on interpretations that are carefully considered, with the balance between voices, harmony and rhythm creating what might arguably be considered ideal performances . . . With superb sound and superlative performances this has to be counted a resounding success . . . Even if you have a truckload of recordings of the French Suites in your collection you are going want to add this one to their number once you've had even the briefest whiff of its rather magical qualities. The well-known G major (No 5) is far from the only treasure. Perahia's playing is a constant delight . . .
. . . a very fine sound, suited to the clean, thought-through performances. The pianist's debut recording for Deutsche Grammophon has deservedly won many admirers. Clarity and pureness of articulation, coupled with impeccable musicality, have long marked Perahia's Mozart; here they illuminate Bach . . . This release is of a similarly exalted level, the superb recording-perspective warm yet fully supporting Perahia's textural transparency . . . the performances are fully about Bach, not Perahia, shining with honesty. Technically, every Suite is impeccable, not just in terms of surface delivery but also in touch and rhythm . . . Perahia's achievement is to convey the glorious diversity of Bach's invention in these works: the famous Gavotte of Suite No 5, deliciously despatched, lies next to a limpid "Laure". An indispensable release, not just for lovers of Bach, but for all musicians of whatever shade.
. . . Perahia playing the six French suites surely sweeps all concerns away. He plays with elegance and taste . . . He sounds like he really enjoys playing the works. As a result the music dances and sings as it should and must. DG's recording sounds warm and rich, yet dynamically incisive and effortlessly clear and detailed. The quality of the sound mirrors the warmth of the playing, and enhances the appreciation and enjoyment of the music. Almost universally, Perahia is praised for his luminous beauty, control, balance and clean articulation in this repertoire. Those elements are not missing in his latest release . . . [Perahia sets down] a record of his estimable artistry on the French Suites.
. . . this is special indeed . . . What has always characterised Perahia's Bach is a sense that you are encountering Bach the man, rather than Bach the god. It's as if Perahia is simply acting as conduit between composer and audience, so subsumed is his ego into the music-making itself . . . each suite unfolds with an inevitability that comes from long acquaintance between music and interpreter. It speaks of a probing musical intelligence too, though to label Perahia simply as an "intellectual" pianist would be misguided, for this is playing that conveys real joy. Perahia plays Bach's "French Suites" with great poetry and precision (the two are not mutually exclusive) . . . I find these interpretations far preferable to the white-rice performances these works too often receive.
. . . [Perahia] plays with elegance and taste . . . He sounds like he really enjoys playing the works. As a result, the music dances and sings as it should and must. DG's recording sounds warm and rich, yet dynamically incisive and effortlessly clear and detailed. The quality of sound mirrors the warmth of the playing, and enhances the appreciation and enjoyment of the music. Ein neues Album von Murray Perahia in den Händen zu halten ist jedes Mal ein Augenblick großen Glücks. Selig wird man, wenn die ersten Klänge den Raum erfüllen. Es gibt nur wenige, die so unmittelbar mit ihrer Kunst berühren . . . [Perahia] gestaltet in den stilisierten Tänzen Momente von höchster Eleganz. Exquisite Meisterstücke, filigran, zart und delikat, von der ersten bis zur letzten Note. Ob Allemande, Sarabande, Gavotte oder Bourrée -- Perahia spielt Bach mit ganzem Herzen und mit ganzer Seele und findet dabei stets den richtigen Ton, die richtige Stimmung: mal elegant, mal frech, mal melancholisch, mal heiter-verspielt. Wunderbar! Avec un premier album chez Deutsche Grammophon, une nouvelle page s'ouvre dans le parcours discographique de ce grand maitre du piano, au sommet en ses glorieuses années de maturité . . . Il évoque d'un ton mesuré, mais tout prêt à s'enflammer, les relations profondes tissées avec quelques-uns des plus grands musiciens du xxe siècle, le répertoire et, sujet capital s'il en est, le message du compositeur, caché entre les notes, dont il ne cesse de vouloir décrypter les secrets.
. . . Perahia avait approfondi son approche du répertoire pour clavier du Cantor, toujours dans sa vision hautement poétique et chantante des oeuvres: il fait appel à toutes les possibilités du piano, sans jamais aucune rudesse mais avec ce qu'il faut de percussivité dans les mouvements plus anguleux -- menuets, gigues -- et avec une infinie tendresse dans les mouvements plus lents et réfléchis, sarabandes en tête. La danse, chez Perahia, rime avec la quintessence. Et la puissance tranquille de son geste, équilibré tout au long des Suites francaises, captive . . . Perahia continue de charmer par le parfait modelé de ses phrasés, le fondant de ses legatos, la plénitude du chant, l'enthousiasme de ses élans . . . on découvre alors, au-delà de la première impression de joliesse et de relative sobriété, les richesses de ces pages enjouées. Le serein dialogue entre les voix . . . les multiples contre-chants qui, le plus naturellement du monde, fleurissent ici ou là . . . les savoureux frottements harmoniques qui naissent des appoggiatures (Gigue de la no. 2), sont autant d'exemples du talent de Perahia pour faire rimer rondeur avec profondeur, beauté avec inventivité. Dans la Gigue en sol, l'appel de la danse enflamme progressivement tout le clavier. On retrouve avec bonheur sa manière, les troublantes épousailles de la dynamique et du chant, des phrasés amoureusement modelés, un toucher poétique aux couleurs pavoisées. C'est l'esprit même de la danse qui prévaut dans cette sonorité à la fois puissante et subtile qui modèle la musique avec le recueillement et la ferveur d'une création neuve, dégagée de l'interférence du monde, des époques, des normes et des modes. Un Bach éternel, en quelque sorte.
. . . Murray Perahia inaugure en beauté sa collaboration avec la Deutsche Grammophon au travers d'une version intensément vocale des "Suites francaises" . 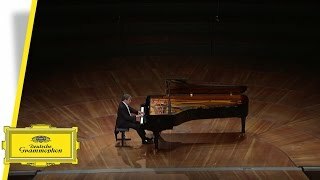 . . D'entrée on retrouve un "son Perahia", subtile alchimie d'un toucher résolument pianistique, évitant toute imitation avec le clavecin, et une prise de son toujours charmeuse et agréable à l'oreille, riche en perspectives. Sur ces bases-là, l'auditeur est déjà comblé. Pour autant, l'approche de Bach au piano à un tel niveau est plutôt rare. On ressent ici beaucoup d'affirmation dans cet art du discours si cher aux interprètes baroques, que Perahia sublime par un toucher profond, vocal et totalement libéré. Les allemandes déroulent leurs thèmes avec grâce tandis que les courantes et les gigues déploient une énergie communicative. Il n'est que d'écouter la fameuse gigue de la suite no. 5 pour s'en convaincre. La dynamique du piano est utilisée à plein, rendant ces textes intemporels et loin de tout dogmatisme musicologique. C'est là le miracle Perahia: la musique seule pour convaincre, le but est atteint! À la suite de ce premier album pour l'étiquette jaune, on se plait à attendre d'autres cycles que le maître nous fera sans doute redécouvrir grâce à son approche unique et enthousiasmante de Bach. On October 7 Murray Perahia releases his first album for Deutsche Grammophon presenting Bach’ French Suites. He sees the French Suites as “Bach on the highest level”, adding, “I don’t think Bach wrote one note that didn’t have wider meanings and that wasn’t to be tackled with all one’s heart and soul.” His recording revels in the music’s diverse moods, from melancholy tenderness to out-and-out joy, and brings out every nuance of its elegant phrasing and expressive dance rhythms.